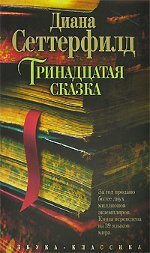 ﻿ Diana Setterfild "The thirteenth fairy tale"
The main > Books> It is thin. literature> Diana Setterfild "The thirteenth fairy tale"
Diana Setterfild "The thirteenth fairy tale"
There are many examples of successful literary debuts when the first book of the young writer literally at once became the best-seller. If we put all such books on one shelf, not the last place on it would be taken by the novel "Thirteenth Fairy Tale" of Diana Setterfild. The British writer Diana Setterfild, as well as Kauffman (one more talented debutant) Is white, earned a living by teaching. But in 2006 Diana's life abruptly changed: its debut novel "Thirteenth Fairy Tale" took the first place in a rating of best-sellers "New York Times". The novel was translated into different languages and published more than in thirty countries. "The thirteenth fairy tale" is written in the best traditions of the Gothic novel (this genre, by the way, served as the ancestor of "literature of horrors", King and Lavkraft "grew" from the Gothic novel). Roman Setterfild quite often compare to works of sisters of Bronte (in particular, "Jen Eyre" and "Wuthering Heights") and Daphne du Maurier. Reviewers even called the book "Thirteenth Fairy Tale" "new "Jen Eyre"". The main character of the novel "Thirteenth Fairy Tale" Margaret Li works in the second-hand bench belonging to her father. But one fine day Margaret receives the unusual offer: the best-known modern writer Vida Vinter suggests it to become her biographer. Unexpected turn of events, after all Ms. Vinter is well-known not only the books, but also that did not tell words of the truth not to one interviewer yet. Of course, Margaret agrees, and the most interesting begins here. She moves to the gloomy mansion occupied by past ghosts. Within the walls of this mansion the history of twin sisters, Gothic in literal sense of this word is developed. Oddly it has something in common with personal history of Margaret and gradually brings to a solution of secret which demented not one generation of readers — secret of "The thirteenth fairy tale". The rights for the novel "Thirteenth Fairy Tale" were bought for the sum, improbable for the beginning author. Diana Setterfild received 800 thousand pounds sterling for the British edition, for American — one million dollars. The book is considered the recognized masterpiece of modern English prose which opened a genre of "neogothic style" for general public. Critics even say that the novel Setterfild marked return of the Golden Age of the British novel. Now Diana Setterfild works on the second novel. And it is pleasant because some debutants (for example, Mariam Petrosyan) after success of the first book solve on it and to stop the literary activity. Let's hope that the following work Setterfild will take the level of quality delivered to her and even will lift it. Quotes from the novel "Thirteenth Fairy Tale"
"Human lives — it and accurately to spread out not separate threads which can be disentangled from a ball on an equal surface. The family — is a figured web. It is impossible to touch one its thread, without having caused thus vibration of all others. It is impossible to understand a particle without understanding whole …"
"Ordinary people — that is not twins — look for soulmates, fall in love, contract marriage. Suffering from own incompleteness, they try to make couple with somebody"
"All children mythologize the birth. So we are arranged. Want to understand better than the person, to see his true essence? Ask it to tell about own birth. That you will hear in reply, will not be the truth; it will be a fantastic story. But from such stories we learn the most important"
"The birth — it began not the present. Our life since its first minutes is not something belonging only to us; actually it only continuation of someone's history"